Biographical Info Michelle Boudreau is a Folk, Blues and Roots singer/songwriter, spoken word artist, gardener and mom. You'll hear a melodic twist, a unique blend of original music as well as a little Johnny Cash, Memphis Minnie and some Jug Band Blues. 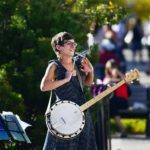 Michelle has toured the corners of Canada, playing festivals and stages abroad, bringing audiences to groove and toe tap to her catchy melodies. ---"Boudreau is a powerhouse and her raw energy is contagious." Kelley Jo Burke ,The Gallery, CBC Saskatchewan Canada --- Boudreau has toured across Canada and played many festivals, hockey games, sharing and playing the stage with many great artists such as Blackie and the Rodeo Kings, Jane Siberry, Jackie Washington, Bill Bourne, Little Miss Higgins and many more. Michelle Boudreau's original music has also been featured on National (CBC) and International radio, Television (Global/APTN/CBC) and major movie picture, "Surveillance" by director Jennifer Lynch.